Perhaps you never thought that one day your mom or dad may be unable to care for themselves. Your mom was always fiercely independent. She never dreamt of moving from her house, even after dad passed away. Or perhaps dad just seemed content puttering around his small apartment with the dog, until you noticed he had lost weight. Maybe you thought that assisted living was just for the infirm or those with dementia. 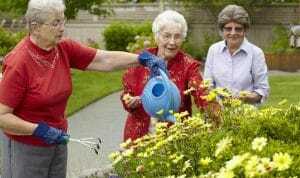 Assisted living can be for anyone needing some assistance with typical day to day activities or care. 75% of assisted living residents are female, and 25% are male. More than 835,000 people across the nation live in an assisted living community. Most are mobile, but 38% of residents receive assistance with 3 or more activities of daily living. Most have 2 or 3 of the top 10 chronic conditions like cardiovascular disease and diabetes. But that is just an overview and statistics, assisted living communities have residents from all walks of life with a variety of needs to make them comfortable and keep them engaged. The reality is that people are living longer, due to medical advancements, but often frail with more ailments and a multitude of medications. They may not be able to manage on their own, and you may not be able to support them like they need. Your parent will need to find a place that is nurturing, helpful, and caring while giving them a semblance of independence. Assisted living can be the perfect fit. First, we should cover the definition of an assisted living community. Assisted living is a long-term care housing solution if your mom or dad needs help and is no longer safe to live independently. An assisted living community provides 24/7 care by trained caregivers in a home environment. The caregivers can assist your parent with the activities of daily living (ADLs) such as bathing, dressing, toileting, personal hygiene, transferring, eating, and medication management. Most communities employ an on-staff nurse to oversee medical plans and assist with changes in care as needs increase. Assisted living communities are like homes, not a hospital. Residents eat meals together in a shared dining room, enjoy welcoming common areas, socialize in daily activities, and live in private apartments that they decorate to their taste. In addition to the expert care and support, assisted living communities are built on a social model to engage residents in activities and make new friends. Unlike a skilled nursing facility or a hospital, assisted living communities offer a wide range of activities including music therapy, entertainment, local excursions, exercise classes, arts and crafts, brain-teasers, lectures, and events to promote comradery. An assisted living community should offer a rotating schedule of daily activities organized by Life Enrichment directors. These directors are skilled at creating unique activities to celebrate the unique individuals that make up a specific community. They create programs based on the interests, tastes, personalities, and traits of those who live there. It should be the mission of the staff to get to know residents and their families intimately so they can serve them better. At age 99, Lois, a retired nurse living at Aegis of Aptos is the anchor to the knitting group. As many as a dozen residents gathered every Friday to put their hands to work knitting hats for Jacob’s Heart Children’s Cancer Support Services. Each colorful cap is lovingly crafted and given to a child with cancer who may lose their hair due to chemotherapy. These knitting seniors have also donated their time and beautifully crafted creations to various charities in the area, including making baby blankets for the Santa Cruz women’s shelter. Each handmade item is a symbol of warmth and compassion for the recipient. Retired USAF Colonel Dexter fulfilled his dream to take one more flight in a historic B-25 bomber. After 24 years of military service and piloting missions over the Pacific Ocean in WWII, resident of Aegis of Redmond, Baker, dreamed of flying again at the age of 93. And 71 years later, his friends and family surprised him at Everett’s Paine Field with a ride in a restored B-25. Our residents are young at heart. At age 92, hospice resident, Betty, wished to feel like a little girl again on Seattle’s Great Wheel. Her health had slowly been declining after suffering two bad falls and a broken hip. They were measuring her time left in months. Van Dyke had told one of her caregivers that wanted to “do something wonderful” in the time that she had left. She decided to ride the Seattle waterfront ferris wheel – something that she hadn’t done since the 5th grade. But don’t take our word for it, meet some of the people who call Aegis Living home for yourself. Or visit in person to meet our residents, families and staff.